Clip on tuners are often used by acoustic musicians. Acoustic guitars in particular have a nasty habit of losing tension during live gigs. When you’re that close to the audience and the sound is that immediate, you simply can’t afford to make any mistakes. I don’t have the talent to tune a string by checking the tension. And, even if I did, that’s hardly a professional thing to do in the middle of a tune. Using a clip on tuner on the other hand, helps me notice if I’m playing off key. Now, whether you’re a pro or just starting out, getting your hands on one of the best clip on tuners is not a bad idea. Even some pros have a hard time noticing when a string is out of tune in the midst of so many instruments on stage. That doesn’t mean you shouldn’t give the audience your best effort, right? These are the best clip on tuners that I’ve tested. What Is a Sound Hole Tuner? 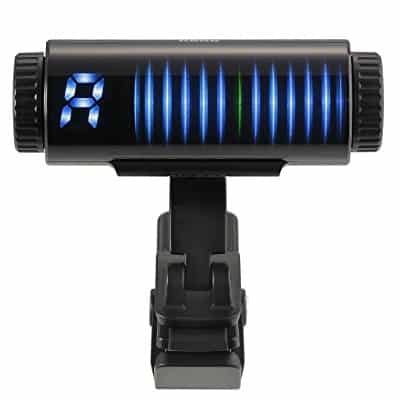 This clip on tuner has a very long-lasting battery life of up to 18 hours. This makes it one of the best guitar tuners for gigs, rehearsals, and recording sessions. It weighs only 30 grams which means you’ll barely feel it on the headstock. Although it lets you see the tunings for all six strings at the same time, it only works like that for standard E tuning. You could also use it as a chromatic tuner if you wish. The accuracy is within 0.5 cent. In strobe mode it is even more accurate. The ultra bright display ensures that you can read the screen even in dark places. 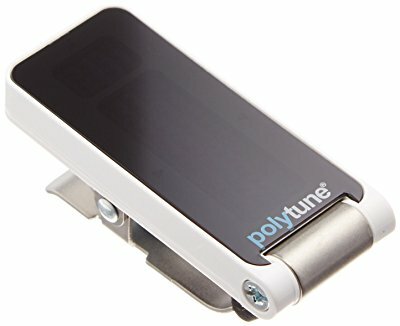 It doesn’t matter if you prefer electric or acoustic guitars, the PolyTune Clip works for both and it looks quite elegant too. KLIQ Music Gear is known for the accuracy of their KLIQ UberTuner. This little gadget doesn’t just help amateurs to stay in key but it is also a popular choice among professional musicians. It’s no wonder that it’s one of the best tuners and a hot-seller. Of course, there’s more than accuracy involved. Another feature that separates the UberTuner from the rest of the pack is its frequency detection speed. The battery life is also quite good as it gives you 16 hours of uptime. That’s even more impressive once you notice that this is one of the lightest clip on tuners on the market (including the battery). The screen readability is great too with its LED backlight that doesn’t draw too much power. There’s no surprise that the new Snark SN-8HZ is not packed with fancy features. After all, Snark tuners are so popular that most customers demand accuracy over anything else. If precise tuning is what you’re going for, this might just fit the bill. Super-tight tuning is its trademark. Sure, the new display is also an improvement over previous designs. It’s brighter and the lines are a bit bigger too. You can rotate the display 360 degrees. This means you can easily monitor your tuning regardless of your stance or the instrument you’re using. It also has good readability from almost any angles due to the superior quality of the screen. There’s a very good reason why the Sledgehammer Pro enjoys better sales than its predecessor, despite a serious price difference. You will notice a massive improvement in response time and tuning accuracy from the Pro model. Of course, if you’re a total beginner, perhaps this is overkill. Nevertheless, the 3D visual meter is very easy to read and looks pretty cool too. You can even customize your readouts between standard, strobe, and half strobe. You can use the right wheel to calibrate between 436 and 445Hz. When used in strobe mode, it’s perhaps the best option in terms of accuracy. The battery life is also quite ok for the amount of energy-draining features that thistuner has. 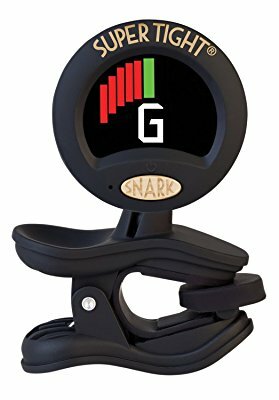 Here’s another Snark clip on tuner for you, and you can't really blame me, because if you’re looking for value, Snark usually delivers. The SN5X clip on tuner is a great example of how good things come in small packages. It has the same familiar Snark full-color display. It can display frequency ranges for guitars, violins, and bass guitars. You can also put it on the front or back of the headstock depending on how close you want it. This will only benefit the readability without any effects on tuning accuracy. This display also rotates 360 degrees. You can also tap a metronome tempo on it, which would come in handy in rehearsals or at home. This tuner occupies a sweet-spot between the cheapest ones on the market and most midrange models. 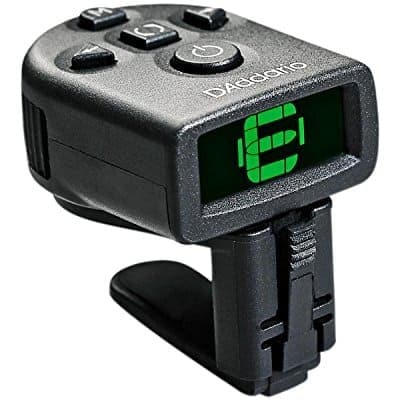 The D’Addario NS Micro is a very precise tuner that won’t cost you a fortune. The price is slightly higher than the SN5X but it does offer a few more features for the extra buck. For one, you have a couple of buttons on top which you can use to adjust between tuning methods. You can also use a visual metronome if you want to practice tunes, scales, and specific licks you have yet to master. It’s also very small and lightweight which makes it great for both big and small string instruments, such as a ukulele or mandolin. Although it’s worth noting that the accuracy on small instruments is a bit lacking. In terms of readability, this is not one of the best. But overall, it’s one efficient and accurate tuner. When you’re performing, you don’t have time to be picky. Even the best models on the market could end up failing you on stage. My personal preference is a tuner that reads frequencies fast so adjustments can be made on the fly without impacting the natural flow of a song. What’s also cool about this is that most clip on tuners work off vibrations. This means you can turn your volume down and tune your string without messing up the song. You realize that acoustic guitars don’t come with a cord? Electro acoustic guitars do, but I’m not talking about those. Unless you can tune a guitar by ear or you’re near a computer and have a microphone on hand, it’s hard to accurately tune an acoustic string instrument. This is why getting your hands on a clip-on tuner is very important, especially if you’re in your learning phase. Playing off key for any amount of time can cause bad habits. You may even have trouble recognizing what a proper tune should sound like if you keep practicing without fine-tuning your instrument. They’re also way easier to carry around to gigs. Some pedal tuners can be quite heavy and large so you might not be able to fit them in your case. They may be easier to misplace, I’ll give you that, but the smaller models can be left untouched on your headstock without any issue. When shopping for tuners, pay attention to the tuning modes and frequency ranges (or types of instruments) covered. I myself made a mistake a while back and bought a tuner that couldn’t handle non-standard and custom tunings. Chromatic tuning is your best friend! When you place a clip-on tuner on a guitar headstock, a built-in contact microphone picks up the pitch when you play. Clip-on tuners work in a similar way as piezo pickups in the sense that they pick up the vibrations from the strings rather than picking up sound or electric signal. In the past, clip-on tuners were notoriously unreliable, especially in noisy environments. But since 1995 they have improved leaps and bounds and are now a ubiquitous option for use at home and on stage. There is no science to using a clip-on tuner even if you are a complete novice. There are just a few steps to follow and you are good to go. Place the tuner on the headstock so it doesn’t come in contact with the strings or pegs. Turn on the tuner and strum the E string, then move the peg to tune it. Once the display changes color, you’ve got the note and can move to the next string. Even though clip-on tuners are quite popular and reliable, they do come with some disadvantages. But let’s first start with the advantages. First of all, these tuners are very small and so very easy to carry around from one gig to another. They also do a decent job of tuning a guitar in noisy environments. 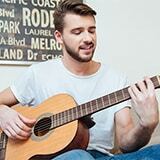 In addition, there is no need to plug in anything when you need to tune an acoustic guitar. On the other hand, the small form factor might be considered a downside as well. They can be easily lost or broken if you are not careful. At the end of the day, clip-on tuners are not as accurate as the ones that plug in and they don’t mute the guitar volume. The simple answer to this question is no, they are not. You can get a fancy and accurate clip-on tuner for not much. The affordability is, among other things, the reason why these tuners have become so popular. 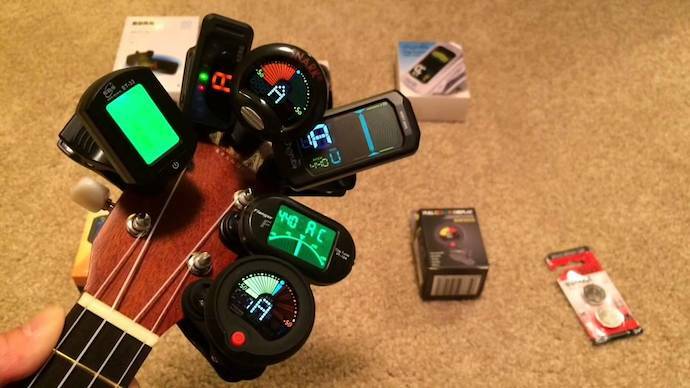 If you are an aspiring guitarist, you should not think twice about getting a clip-on tuner. It can help you get back in tune more easily and you might even get better at training your ear to the correct key. A sound hole tuner is a special type of guitar tuner designed for accurate tuning of acoustic guitars. As its name suggests, it clips onto the guitar sound hole rather than the headstock. One of the best things about these tuners is that they are quite stealthy. There is an adjustable clamp that allows you to fasten this small tuner securely to the sound hole and forget that it’s even there. 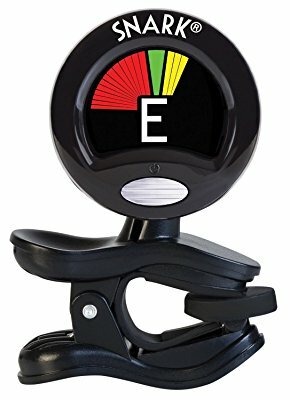 This tuner position might be the most natural for a guitarist. The sound hole tuner works like the clip-on tuner. A piezo transducer picks up the vibrations from the soundboard and displays them as notes. 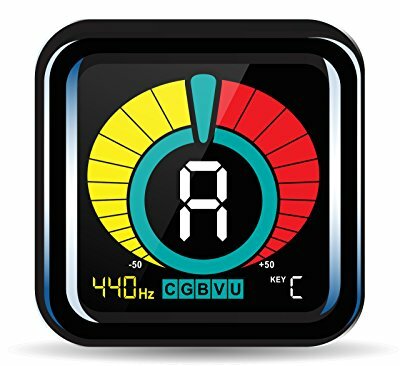 Hopefully this list I’ve made will help you spend less time searching for the best guitar tuner that fits your budget and needs. Remember that you won’t always need fancy features and large screens to get things done. Of course, just reading about awesome clip on tuners won’t do you much good. Eventually it’s a good idea to just get your hands on one or two and test them out yourself. Not everyone will have the same experience because the instrument of choice also matters.